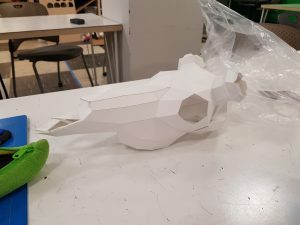 After our tour of the costume creation studio in Purnell, I was inspired to create an animal mask stylized with low-poly geometries after seeing a rabbit and fox mask with the same design. I chose to create a deer mask, since I had wanted to add color and the antlers of a deer give a majestic presence that I wanted to enhance with color. 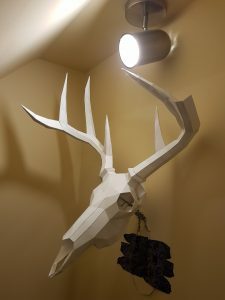 This is when I ran into problems, as I couldn’t find a deer template with the low-poly geometries that I had wanted to create a mask, and therefore I attempted to create my own pattern. I used plasticine and a wireframe to model a deer head. I then would try to create facets by cutting off faces on the model, but I soon realized that the faces I created were not precise and it was difficult to maintain clean edges between faces. I opted for another approach, to cut out pieces in paper and then impose them onto the model, but I realized that this was very tedious since the pieces needed to be exact, and the plasticine model needed to be adjusted every time. Hence, I scrapped the idea to use plasticine, and instead explored 3D modeling. I taught myself how to create low-poly models from higher resolution models, and then export them to a papercraft program to unfold and transform into templates. However, I ran into further trouble when I couldn’t find any deer head models that fit my needs. I also did not have any 3D modeling experience. 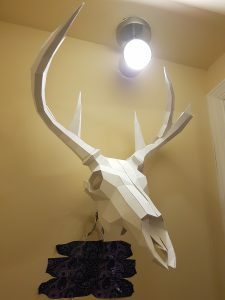 From my exploration of deer head models, I did find a model of a deer skull that I thought would make an impressive model, although not a mask. Therefore, I went ahead and made the deer skull. 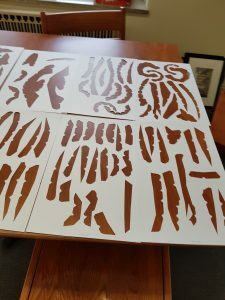 Starting with the digital template, I scaled the model up to the size I had wanted, and printed them on 11 x 17 inch construction paper I had cut out. 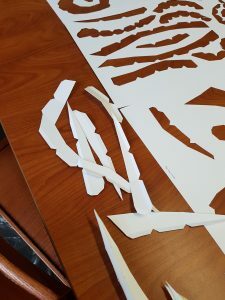 I then began constructing my model, carefully cutting out each piece and gluing them together. I first made one half of the head, then the other, and then piecing them together down the middle. I then made the antlers, leaving one slightly unfinished. After our critique, I actually preferred the unfinished look to what I had originally planned. I remember a comment during my critique mentioned that the raw look of the model is what made it unique, and differentiated it from something that could have been bought premade. I also ended up making a display stand from wire so that it could be put up on a wall. 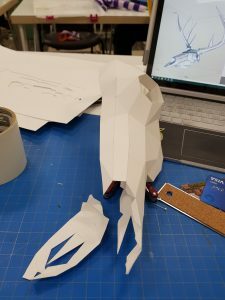 From this project, I learned a lot about how to approach papercraft, about techniques to gluing that would ensure a proper hold between pieces, about ways to create straight and clean folds, and a little about 3D modeling as well. 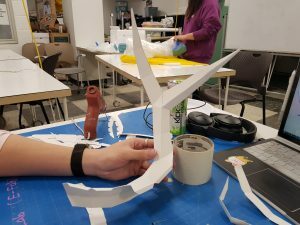 If I were to make the project again, I would definitely look more into 3D modeling, and perhaps use a faster drying glue to speed the construction process.